Saudi Crown Prince Mohammed bin Salman has dazzled international media and public opinion by lifting some restrictions on women’s rights, holding out hope for the abolishment of others, and a vow to return the kingdom to a vague form of moderate Islam that many believe is defined by the social reforms he has already implemented and his curbing of the powers of the country’s ultra-conservative leadership. No doubt, Prince Mohammed’s reforms have benefitted women and created social opportunity with the introduction of modern forms of entertainment, including the opening this month of Saudi Arabia’s first cinema as well as concerts, theatre and dance performances. Similarly, anecdotal evidence testifies to the popularity of Prince Mohammed’s moves, certainly among urban youth. Yet, Prince Mohammed’s top-down approach to countering religious militancy rests on shaky ground. It involves a combination of rewriting history rather than owning up to responsibility, imposition of his will on an ultra-conservative Sunni Muslim establishment whose change of heart in publicly backing him lacks credibility, and suppression of religious and secular voices who link religious and social change to political reform. 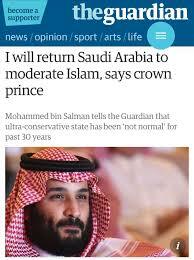 Prince Mohammed has traced Saudi Arabia’s embrace of ultra-conservatism to 1979, the year that a popular revolt toppled the Shah and replaced Iran’s monarchy with an Islamic republic and Saudi zealots took control of the Great Mosque in the holy city of Mecca. While there is no doubt that the kingdom responded to the two events by enhancing the power of the kingdom’s already prevalent ultra-conservative religious establishment, Prince Mohammed appears to brush aside Saudi history. The power of the establishment and the dominance of Wahhabism in Saudi Arabia dates to 1744 when Mohammed bin Saud, the founder of the Al Saud dynasty, concluded a power sharing agreement with Islamic scholar Mohammed bin Abd al-Wahhab that lent Bin Saud the religious legitimacy he needed to unify and control Arabia’s warring tribes. Prince Mohammed’s uncle, King Faisal, who ruled Saudi Arabia from 1964 until his assassination in 1975, embodied the export of ultra-conservatism as a pillar of Saudi diplomacy and soft power. Faisal saw it as a way to create a network of supporters capable of defending the kingdom’s strategic and economic interests while simultaneously catering to the outlook of Saudi Arabia’s religious establishment. Both the Muslim World League, one of the kingdom’s primary vehicles for the funding of its global campaign, and the Islamic University of Medina were founded in the 1960s. The university served as a citadel of ultra-conservative learning and thought, including the notion that Islamic law dictates unquestioned obedience to the legitimate ruler. Prince Mohammed has exploited that view to put the religious establishment in its place and legitimize reforms it condemned for decades. In doing so, he not only undermines the credibility of ultra-conservative scholars but also enhances that of both more militant ones and those he has either imprisoned or silenced because they advocated not only social but also democratic reforms like free and fair elections, release of political prisoners and respect for human rights. Prince Mohammed’s assertion that Saudi Arabia propagated ultra-conservatism as part of countering communism during the Cold War is not inaccurate but ignores the fact that Saudi Arabia felt threatened by Arab nationalism, not simply because countries like Egypt and Syria aligned themselves with the Soviet Union, but also because they questioned the legitimacy of monarchs. Aligning Saudi Arabia with the West, moreover, ensured that the United States had a greater stake in the survival of the Al Sauds. Born 14 years after the events of 1979, Prince Mohammed’s projection of a kingdom whose liberalism was hijacked by Cold War-inspired policies and errant Islamic scholars jars with that of Saudis who are generation older. They recall a process in which post-1979 ultra-conservative social mores were codified into rules, regulations and laws. “I was a teenager in the 1970s and grew up in Medina… My memories of those years…are quite different… Women weren’t driving cars. I didn’t see a woman drive until I visited my sister and brother-in-law in Tempe, Ariz., in 1976. The movie theatres we had were makeshift… You would pay 5 or 10 riyals (then approximately $1.50-$2) to the organizer, who would then give a warning when the religious police approached. To avoid being arrested, a friend of mine broke his leg jumping off a wall. In the 1970s, the only places on the Arabian Peninsula where women were working outside the home or school were Kuwait and Bahrain.” said Jamal Khashoggi, a prominent Saudi journalist who last year went into self-imposed exile because he feared arrest. Prince Mohammed seemed to acknowledge ultra-conservatism’s long-standing and deep-seated shaping of Saudi culture when he was asked about abolishing the kingdom’s system of male guardianship that forces women to get approval of a male relative for most major decisions in their lives. “We want to move on it and figure out a way to treat this that doesn’t harm families and doesn’t harm the culture,” Prince Mohammed said. Mr. Khashoggi traces the formalization of existing social restrictions on women’s rights not to an edict issued by the religious establishment but to an attempt by a 19-year-old princess to elope with her lover. The couple’s drama, ending in public execution in 1977, was described in ‘Death of a Princess,’ a dramatized 1980 British documentary that strained relations between Britain and Saudi Arabia. The incident marked the kingdom’s first major effort to use its financial and energy muscle to thwart freedom of the press beyond its borders and shape its international image. It also spurred codification of the suppression of women’s rights. “The reaction of the government to the princess’s elopement was swift: The segregation of women became more severe, and no woman could travel without the consent of a male relative… MBS would like to advance a new narrative for my country’s recent history, one that absolves the government of any complicity in the adoption of strict Wahhabi doctrine. That simply isn’t the case.,” Mr Khashoggi said, referring to Mohammed bin Salman by his initials. Mr. Al-Gosaibi’s warning fell on deaf ears then but has been heard loud and clear by Prince Mohammed. To put his reforms on solid footing, Prince Mohammed will, however, have to acknowledge and confront his country’s demons and pursue structural reform, including a revamping of religious education that currently is limited to shaving off raw ends like hate speech, and the grooming of a more independent and critical class of Islamic scholars rather than whitewash his family’s role, whip its former allies into subservience, and suppress any expression of dissent. “Strangling moderate independent Islamic discourse may succeed in silencing democratic voices within Islam in Saudi Arabia, but it will also create a vacuum for the less moderate discourse that the state has shown it tolerates,” said Abdullah Alaoudh, a post-doctoral fellow in Islamic Law and Civilization and the son of Salman al-Odah, a Saudi scholar imprisoned since September for calling for social as well as political reform.